Video Advertising is a great way to promote your brand and get genuine customers or visitors to your product or website. Read all the modules and get Video Advertising Certification with the help of AdWords Video Advertising Exam Questions and Answers. True or False: Advertisers can set bids per ad format. § YouTube, with the privacy settings changed to "Private"
§ YouTube, with the privacy settings changed to "Public" or "Unlisted"
________ are optional, clickable thumbnail images that appear next to TrueView InStream ads on YouTube. When is someone added to an advertiser's video remarketing list? Which can't be added to a TrueView video? What's the difference between cost-per-click (CPC) bidding and cost-per-view (CPV) bidding? What's the maximum lenght a TrueView video ad can be? Which should you consider when evaluating the performance of an advertiser's TrueView campaign for brand awareness? What's the view rate of an AdWords campaign that shows 10,000 impressions, 900 views and 300 clicks? True or False: TrueView in-stream ads and TrueView in-display ads can be in the same video campaign. True or False: Video ads may appear in videos marked "Private" on YouTube. What's needed for an advertiser to set up a video ad campaign? What's an example of a managed placement for a TrueView in-stream ad? Which ad rotation option can't used for video campaigns? § all impressions appearing in an ad position of "1"
§ Enter specifications on the "Reservation tab"
Disclaimer: Using these answers resulted in 89%, so they are not all correct. 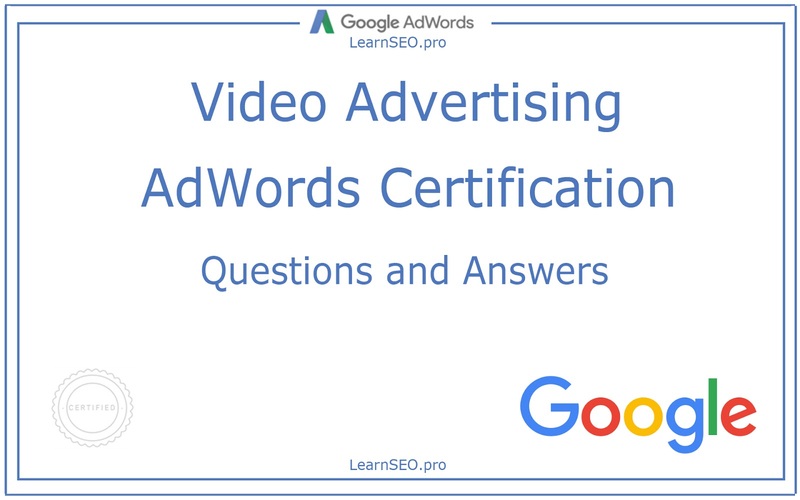 Double check your answers while giving Video Advertising Certification exam! After completing AdWords Video Advertising Certification, you can promote your brand on YouTube. Get Questions and Answers of Video Advertising Certificate.